The Magic Master Message Board Sign - Horizontal, can be hung from the ceiling or window. 4 inch letters in black with red numbers and symbols make attention getting signs that are clear and easy to read. Large 24" x 36" sign face can't be missed. 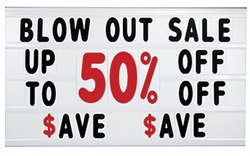 Changeable Message Board Sign with 4-line 36" x 24" white sign face and over 300 - 4" letters and numbers. 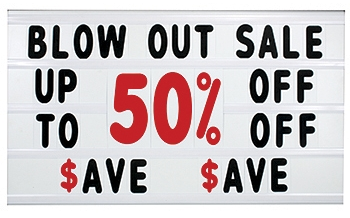 1 - 36" x 24" x 0.5" (600 x 900 x 10mm) white sign face with letter tracks on one side. 1 - set of 189 - 4" letters, numbers and symbols (Black letters, Red numbers). 1 - set of suction cups.